Acne scars fall into two main categories: those caused by a loss of tissue (atrophic scars), and those caused by an excess of tissue (hypertrophic scars). Within these categories, there are four main types of acne scars: ice pick, boxcar, rolling, and keloid scars. Acne scars can be difficult to treat, and may require combined treatments to see real improvement. Unfortunately, over-the-counter products simply aren’t powerful enough to improve anything besides discoloration. There are procedures, though, that can improve the look and texture of your skin. Your options depend on the type of scarring you have. Most people have more than one type of scarring on their skin, so you might need a few different treatments to see the best results. Advanced skin rejuvenation treatments are combined to produce optimal results. Fractional laser and Sublative & Sublime technologies for skin resurfacing and acne scars removal (radio-frequency energy or electrical as opposed to laser, which is light energy) to deliver an effective fractional and tightening treatment to reduce and remove acne scarring. Sublime Skin Contouring (formerly known as ReFirme) is a treatment that combines infrared light with radiofrequency to firm skin as well as tightens lax skin. The combo treatment is excellent for the skin of any color and has little downtime or disruption of daily activities. Discomfort is minimal. The two together yield an improved skin surface regularity as well as firming and tightening. How do I know if I need a fractional laser treatment? Fractional is a treatment for those who would like to improve wrinkling and sagging of the skin, reducing pore size appearance, and diminish stretch marks or acne scarring. The combination of Fractional laser, Sublative Rejuvenation Skin Resurfacing and Sublime Skin Contouring (formerly known as ReFirme) treatments reverses skin damage. The combination of laser energy and radiofrequency energy deeply heat layers of the skin while protecting the surface of the skin simultaneously. Medium to deep heating of the skin activates fibroblasts (deep skin cells) signaling new collagen to form and existing collagen to tighten, which could occur over a 1-3 months period. 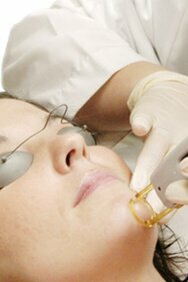 The laser delivers an effective but controlled fractional treatment. Each pulse delivers the energy via a grid of matrix spots on the surface as well as just under the surface. Fibroblasts (skin cells that produce collagen) are activated within the treated zones signal collagen to regenerate and remodel, yielding improved skin tone and texture. The surrounding tissue of the untreated areas supports and accelerate the healing process of the skin. The procedure is mildly uncomfortable. Side effects are redness and swelling after the procedure that lasts from hours to days, and occasionally even up to a week, depending on the body parts and required energy for each treatment. How would I look after the treatment? Most patients have redness and swelling for a few hours to 3 days after the treatment (on body parts may last longer). You may apply make-up to the treated area immediately after the rejuvenation procedure. Tiny crusts may develop and are present for a few days. Results develop over time and with subsequent treatments. Full results may be appreciated at three to six months following the last treatment. At our clinic we combine fractional laser and mesotherapy to remedy acne scars. I would definitely give this clinic a 5 star rating. This is the second time around I’m using their treatment and couldn’t be happier. The staff here is really friendly and informative and they use state of the art technology when it comes to their equipment. Their procedure is definitely worth the money and you can notice a difference in your skin right after the first session. Highly recommended!! I never leave reviews but I need to do this for anyone else who is feeling depressed about their skin. I almost cancelled my first appointment because I was so skeptical, embarrassed + defeated after going through so many attempts to rid of my acne scars… dermarollers, microdermabrasion, facials, chemical peels, liquids, jade rollers, mud masks, anything you can think of, I’ve used to try and help the scarring on my face. NOTHING, N-O-T-H-I-N-G, worked. One morning, after doing my make-up, I found myself standing by a mirror in daylight and upon looking at it…I almost cried.The makeup made my scars look 1000x worse, they were so noticeable and my heart broke. My friend recommended laser to me and I did a lot of research before finding out about Sublative and Sublime e2 laser. I chose this clinic because they price match (something I wasn’t able to find anywhere else) and the price they charge is unbelievable (in a goodway). They always different seasonal specials so I usually buy package of sessions at a time (they do this text service thing where they text you the specials which is great because i’m bad with e-mail). Staff made me feel comfortable from day 1. Beher put me at ease, advised me on others who’ve undergone the treatment and I got my first treatment done immediately after my consultation. I’ve had 10 treatments so far (yes you will most likely need to invest $$ and come consistently but that’s a small price to pay for the results and the gratification that comes with it). It is beyond anything I expected. Yesterday, I found myself in front of a mirror in broad daylight, and just looked at my face. I could not believe what I was seeing. My scarring…..the once ever present caters on my face..are now virtually UNNOTICEABLE. Yes, they are still there but they are SIGNIFICANTLY changed, plumped up, or something..like enlarged pores. 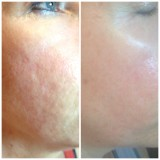 I’ve had a bit of dryness and peeling but absolutely no breakouts or acne of any kind. I can’t wait to see how my complexion will improve even further in the future. I’m truly so grateful. I can hold my head up high while talking now and I am so so so so happy. I recommend anyone to give this clinic a go or call for a consultation. THANK YOU!!!! !